Alexandretta (present day Hatay province of Turkey) is an area in Southern Turkey in the Mediterranean coast bordered by Syria to the South and East and the Turkish provinces of Adana and Osmaniye to the North. 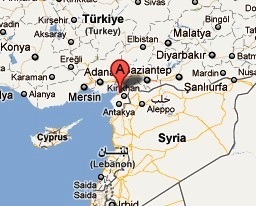 In Ottoman period, the area was part of the Vilayet of Aleppo in Ottoman Syria. It became of the French Mandate of Syria after World War I and became autonomous while being confirmed as a Syrian territory in the Treaty of Lausanne in 1924. In 1937, Alexandretta was recognized as an independent state when Kemal Ataturk (first President of Turkey: 1923-1928) brokered a deal with the French. The state renamed as the Republic of Hatay in 1938 was annexed to Turkey in 1939 following a rigged referendum. Syria considers the area its territory and is indicated as such in its maps. Alexandretta started issuing stamps in 1938 and it lasted only for a few months. There were no original issues. All the stamps issued were ‘Sandjak D’Alexandrette’ overprints on Syrian stamps from the 1930 to 1936 timeframe. The first stamps were a set of twelve stamps (Scott #1 to #12) issued on two separate dates. The first nine stamps were issued on April 14 and the last three on September 2nd. The set is sought after and catalog for around $100 MNH and around $40 for Used. The host set consists of a set of 24 stamps (Scott #208 to #230) and twelve different denominations from that set was used for the overprints. The designs show major landmarks of Syria including View of Hama, Great Mosque of Aleppo, Minaret of Hama, View of Alexandretta, Citadel of Aleppo, Great Mosque of Damascus, View of Antioch, Ruins of Bosra, Mosque at Homs, Square at Damascus, Mosque at Hama, View of Sednaya, Citadel at Aleppo, Ancient Bridge at Antioch, Mosque at Damascus, Ruins of the Monastery of St. Simeon the Stylite, and the Ruins of Sun Temple in Palmyra. The last stamps of Alexandretta were a set of five stamps released on November 10, 1938 that were overprints on stamps from the same set of Syria. The set (Scott #13 to #17) catalogs for around $300 MNH and around $135 Used. These stamps have an additional date overprint that reads ’10-11-1938’ signifying the death of Turkish President Kemal Ataturk. 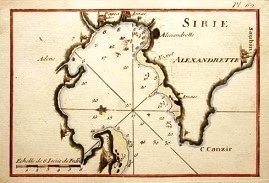 Charts and Maps of the area from the 18th century and prior dates are a good collectible item.